Dedicated to providing a simplified approach to the Spa and Wellness industries for our consumers and partner locations thru a robust mix of user-friendly product offerings. Spaweek.com boasts the largest most comprehensive online directory in the spa and wellness industries. With over 30,000 locations nationwide, the choice of providers, treatments and service types are endless. We seamlessly connect millions of consumers to everything from massages and facials to salons and fitness studios. We’ve got it all. We have over 9,000 spas, salons and wellness locations across the U.S., Canada and Puerto Rico that accept the Spa & Wellness Gift Card. It is the ideal gift for the wellness enthusiast, spa newbie, or anyone who deserves a break from the stresses of their daily life. Its presence in 75,000 national retailers, major loyalty and incentive programs as well as direct to consumer sales, provides an unrivaled gifting experience to consumers and businesses alike. We were founded on deals, and not just any deals but deals with a purpose. 2004 saw the birth of the bi-annual Spa Week Event giving consumers access to full service spa treatments for just $50 each. The Event created a cultural shift opening up an industry to the masses. Today we are focused on offering deals 365 days a year. Our deals are geared towards creating a place for wellness in our consumers’ daily lives at an affordable price. Utilizing our unrivaled knowledge of the spa, salon and wellness industries we deliver a broad spectrum of tools to help simplify the overwhelming world of wellness. Are you unsure where to go, what service to have, what benefits each service provides, what’s the proper etiquette? Well you’re not alone. Millions of consumers are new to the industry and looking for guidance and we’ve got the answers. 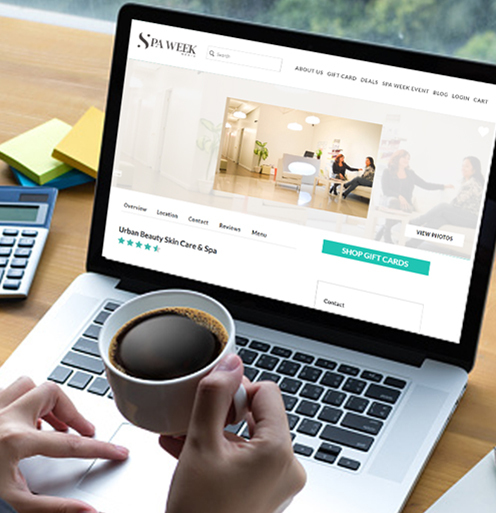 Access the latest wellness news, trends, and product reviews via our Spa Week Daily blog. Ask questions and share your wellness journey with us through our social media channels. Dive right in as we partner with like-minded brands to bring our fans incredible experiences while enjoying a simplified wellness experience.